This is now our households favourite comfort food which is surprising since it contains a stinky cheese children would usually turn up their nose at. 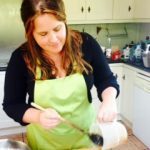 Last summer our french wwoofer Anne received a parcel from home with a very ripe Reblechon cheese in it and announced that she would make us a Savoie region speciality. The Reblechon was very, very ripe and almost beyond my stinky tolerance but I figured(hoped) she knew what she was doing. Anyway she proceeded to spend the next hour frying and chopping and roasting and at the end of it produced such an amazing dish. 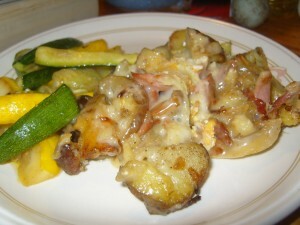 Its creamy and potatoey and bacony and the stinky reblechon loses its strength and just gives it an extra layer of earthy cheesiness. Its like a rustic fondue in a casserole dish . We eat it almost every week ,winter or summer although the french eat it when they get home after a day on the piste. Its a very simple dish with only a few basic ingredients but oh so fantastic. Give it a try. Peel and cube the potatoes and fry them in a small amount of oil until brown and cooked through. Alternatively place in a baking traydrizzle on about a tablespoon of oil , toss and bake at 200degrees for about 40 mins until brown and cooked.We usually make so much that we need to bake two turkey roasting pans full of potatoes. 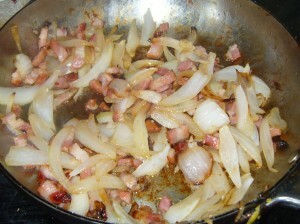 Meanwhile fry the onions and bacon in oil at a medium temperature untill they are dark brown and the bacon is crisp. You need to cook them this long as the carmellisation of the onions and the crispiness of the bacon are crucial to the finished dish . 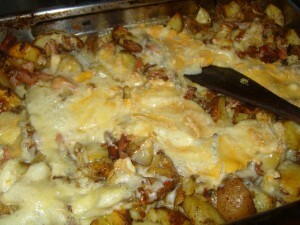 mix the cooked potato , bacon and onion together season with salt and lots of black pepper. 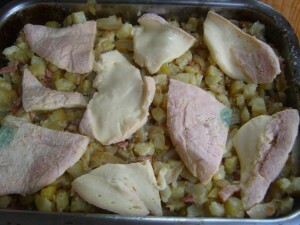 Place the mix in a shallow casserole dish and pour the cream over it. Then unwrap the reblechon and split it through the centre so you have two circles of cheese and then split each circle into about 3 pieces. Place these on top of the potato mix ,cut side down and bake in the oven for about 10 mins at 200degrees until the cheese has melted and the dish is bubbling. Yummmy!. Serve with a nice and crusty rustic bread . 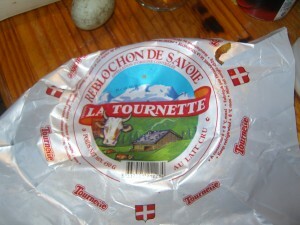 Reblechon cheese is available at good cheesemongers and I freeze extra so I hopefully wont run out . I’ve tried replacing it with Brie, it doesn’t work as well as the brie rind doesn’t melt down but its still tasty. Therefore if you are substituting a brie or camembert remove the rind before cooking. I’ve also seen a recipe using mature Ardrahan cheese which might be worth a try. Its interesting that this isnt a traditional recipe as it was developed in the1980’s by the reblchon manufacturers as a way to sell their cheese . However it is now hugely popular and to be found throughout the Savoy region and beyond. The travelling French/European markets often have stalls cooking huge pans of it and you can even get it locally from the Fleur De Sel stall in the Limerick Milk Market every Saturday. I hope the recipe developer gets royalties!